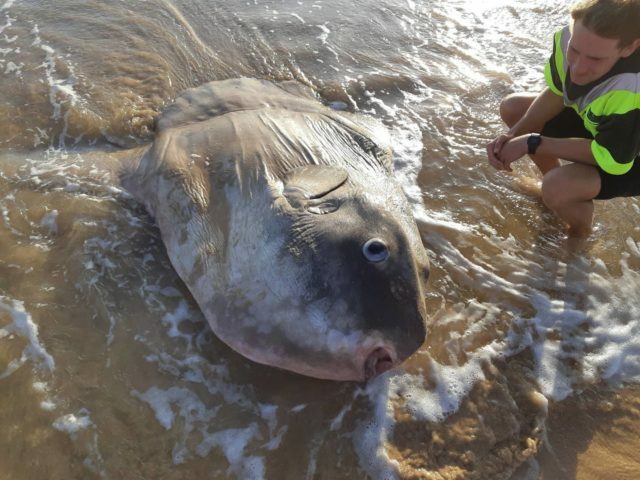 A sunfish so big people thought it was part of a boat has washed ashore in South Australia. The discovery was made by fisherman Steven Jones about 25km east of the River Murray Mouth on the Coorong. Mr Jones’s partner Linette Grzelak, who posted the pictures on Facebook, said the stretch of beach where the creature was found is only accessible by boat and mainly used by fisheries. Ms Grzelak told the Press Association: “My partner, who was out with his cockle fishing crew, came across the sunfish. At first they thought if was a piece of driftwood but as they got closer Steven knew exactly what is was. “He has been a professional fisherman for years so he had knowledge of them, but had never actually seen one in real life. She added the sunfish, at about 8ft high and 6ft long, had “rough, leathery skin”, similar to that of a rhinoceros”. Ocean Sunfish (Mola mola) are listed on the Fishes of Australia database as the world’s heaviest bony fish, with National Parks South Australia adding they can weigh more than a car. They are not “particularly rare” but don’t stay in one area for very long, according to the South Australian Museum. The discovery has become a hit online due to the fish’s unusual features.